With the Applications plugin, candidates can apply to jobs using a form and employers can view the applications on their job dashboard. This plugin requires WP Job Manager 1.22.0 and PHP 5.3+. If you offer job listing submissions on the frontend, you can use this plugin to have applications come in and be visible on the employers job dashboard. If you list your own jobs, you can have applications come in and be visible in the admin dashboard. The plugin can be configured from Job Applications > Settings. Email Application method – Use application form – When enabled, this setting will display the job application form for jobs setup with an email address for applications. Website URL Application method – Use application form – When enabled, this setting will display the job application form for jobs setup with a URL for applications. User Restriction – Only allow registered users to apply – The form will not show to guests until they login. Multiple Applications – Prevent users from applying to the same job multiple times – If enabled, once a logged in user has applied they will no longer be able to see the application form for the same job. Delete with Jobs – Delete applications when a job is deleted – If enabled, job applications will be deleted when the parent job listing is deleted. Otherwise, they will be kept on file and visible in the backend. Purge Applications – Enter a number to purge all applications after that many days. When the application form is submitted, an application will be saved to your database. If the job application method is ’email’, the employer will also receive an email notification. Once an Application’s status has been set to “Hired”, the message “This position has been filled” will appear on the job listing. Note: You can also add the shortcode [job_apply id=”X”] to a page to display only the application form for a particular job listing. Substitute the X with the ID of the job for which you wish to have the application form. Version 2.0 of the plugin comes with a form editor where you can customise the form. 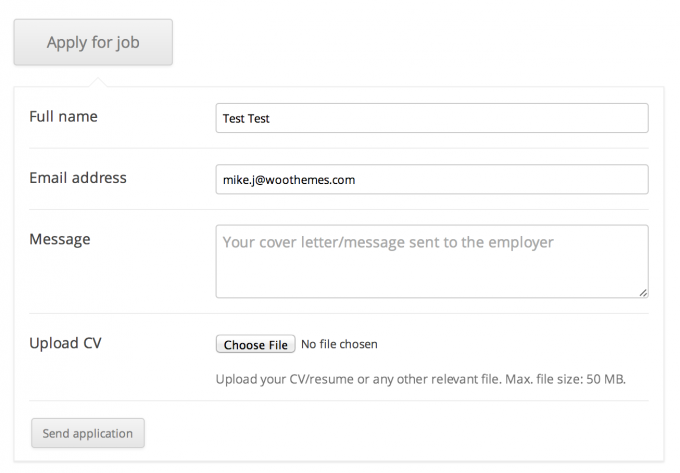 Simply go to Job Applications > Application Form to see the form editor. From here you can add, remove, edit, and re-order form fields. From the form editor page, you will also notice 2 tabs at the top to customise the notifications. 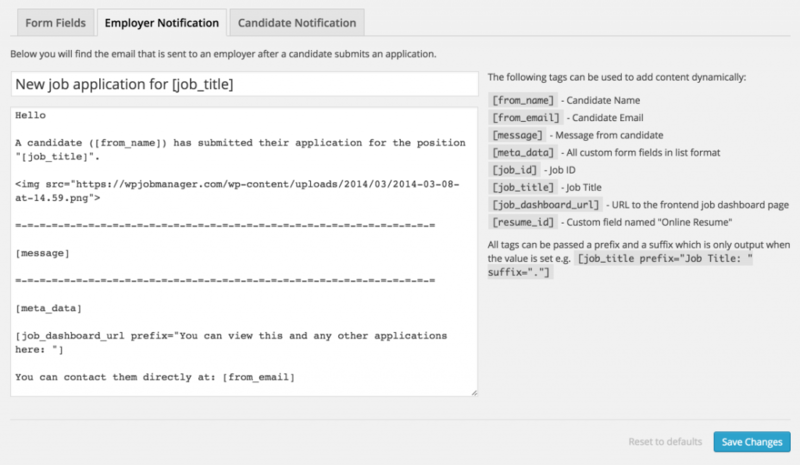 By default, only an employer notification is sent, but if you add content to the candidate notification, candidates will be notified too. The top field will be the subject line of the email, whist the bottom textarea field will be the email contents. The right side of the page shows which dynamic tags you can insert into your message + subject. These will be substituted for real data at the time of sending. You can also choose to sort the applications by date, name or rating. 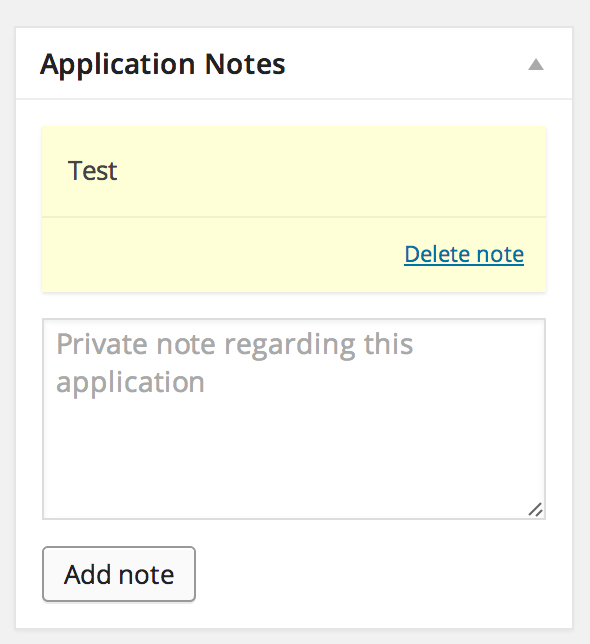 You can also allow candidates to view their past applications by adding the [past_applications] shortcode to a page. You’ll most likely want to add it to the Candidate Dashboard page that is created during the plugin’s setup, but it can be added to any page. If you are using the apply add-ons, applications from those add-ons will also be be created as applications within this plugin. If you are using Resume Manager, the application form will show a select box for the user to choose their online resume. This will be noted with the application allowing the employer to view the online resume.